Did you know Flashbang makes more than one type of holster? I’ll bet if the average person had to name more than one that they produce it would be pretty difficult. But it shouldn’t be. I was one of those people prior to Shot Show this year (an annual industry trade show allowing manufacturers to display their goods and services for press, business owners and other industry people). My husband, Andy, and I visited their booth this year, and to both our surprise they had over a dozen different holsters and belts available to check out. And that’s not their entire line! Their offerings are widely varied, with everything from inside the waistband to outside the waistband, cross draw, belts and, of course, their famous bra holster. They even have an entire men’s line. I was first drawn to the company by the fact that this line was designed by a female who wanted to create ideal holsters for women. The quality of product and discussion with the research and development department sealed the deal with me in wanting to look into Flashbang a little further. I had known about the traditional bra holster developed by them, but to see so many other options available was pretty impressive. The main theme with each holster I tested was to minimize the bulk but keep functionality. I think they are really on the mark with these 5 items, while managing to keep them feminine yet functional by adding colored leather on the interior and additional curved cutting on some of the holsters for added comfort. 1. 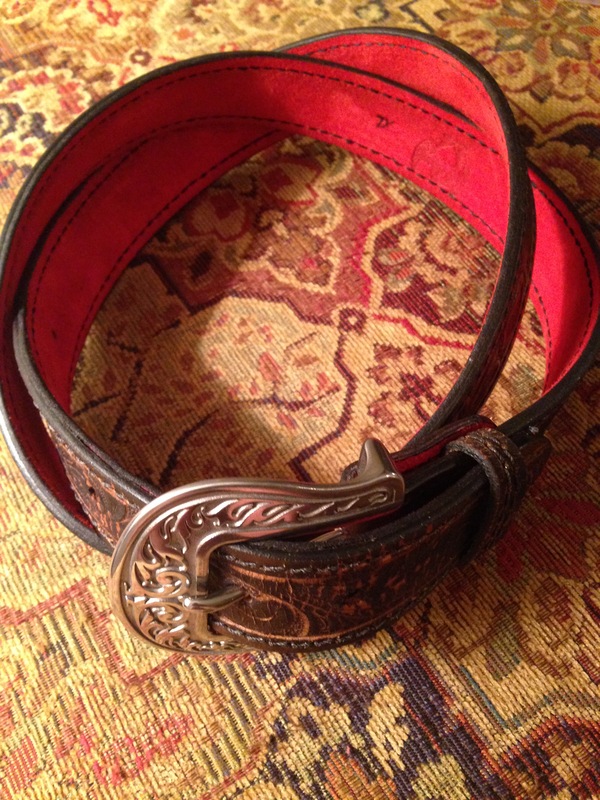 Liberty Belle Holster Belt – Alright. I’ll admit it. A well-made reinforced gun belt makes a difference. I used to say that as long as your belt was high quality leather or a sturdy material, you should be good to go. And for some carry situations maybe you could get away with it. But when the holster needs a little more support, there’s no substituting a quality gun belt. Let’s not mistake what I’m saying here to mean that those nylon gun belts get my fashion stamp of approval. Sturdy, yes. Blends well with a great outfit; not even close. That’s where the Flashbang belt comes in. It’s gorgeous. The leather is high quality. It’s reinforced, but doesn’t feel like I’ve just squeezed a bangle bracelet around my waistline. I was worried that the larger buckle would stand out too much with my outfits, but to my surprise, it worked with all of them. There’s no question the belt held my holsters in place much better than a flimsy fashion belt from Macy’s. And the kicker is that Flashbang dyed the inside red! Don’t ask me why, but yes, it makes a difference (without suffering any quality or product integrity). 2. 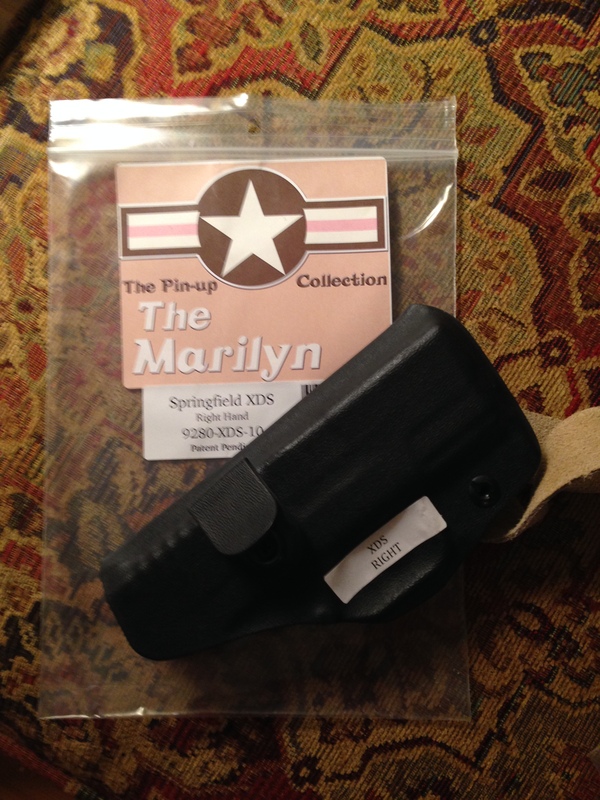 The Marilyn Holster – Too often when a holster doesn’t work exactly as it’s supposed to, we tend to discard it or discount its value. But sometimes a new opportunity presents itself and something useful manifests itself. That’s what happened to me when I began working with the Marilyn holster. The intended position of the Marilyn is inside the bra cup under your arm. The gun is angled in a muzzle-down position and to the rear. This allows for a cross-body draw from a low neckline garment. The intended deployment occurs when you reach inside the neckline of the garment and under the bra, grasping the gun grip and deploying the gun from the holster. This works well for quite a few women, but for me I just couldn’t conceal the firearm well enough (Springfield XDS 9mm). I really liked the idea of the shoulder holster effect of the bra/holster combo, so I began to play around with it a little. Knowing that different bras made of different material allow for different levels of support, I began trying to outfit the Marilyn under the band of material that goes around the side of the bra and hooks in the back. I still positioned the holster so that the gun would sit in a cross-body draw with the muzzle in the rear. The hook molded to the holster came up out of the top of the bra band and attached at the top of the band or cup (depending on the shape and size of the bra). The leather strap wrapped around the other end of the holster and the bra band together, snapping into place. When I inserted the firearm into the holster, the grip was easy to reach. It stuck out below the bra band enough so that I could get a full grip before deploying the gun. I wore the Marilyn in this unintended position all day without any problems; no printing and no discomfort. I then contacted the company to make sure there weren’t any problems in carrying this way that they could see that maybe I was missing. I was pleasantly surprised when they came back with a positive reaction. They were pleased that someone had found another way to carry one of their holsters, and they couldn’t see any drawbacks from this way of mounting their holster to a bra. Great response from an innovative company. I found carrying with the Marilyn holster favorable. Just make sure you practice deploying with a cross-body draw. It’s different than inside the waistband or other traditional carry options. Quick note: If you are going to try this alternative way to use the Marilyn, make sure that you use a bra made of more durable material. Soft cotton, lace and other stretchy material won’t work very well. Satin (less stretch) or a sports bra that hooks in the rear like a traditional bra will work best. Excellent information for women who carry. Great details. Thank you, Dave. The holster industry is definitely coming around to what women need.